Considered to be one of the most popular animals in the world, the endangered tiger is the largest ‘cat’ and one of the fastest. 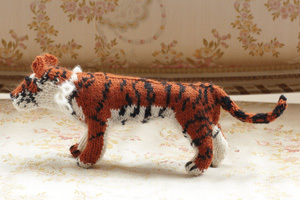 Because of their speed, tenacity and distinctive markings, the tiger is a popular character in many books: Shere Khan in The Jungle Book, bouncy Tigger in Winnie-the-Pooh and The Tiger Who Came To Tea by Judith Kerr. My cousin, in Italy, cared for Wotan, a tiger cub until he became too big. She felt that Pi in Life of Pi shouldn’t have been so scared of Richard Parker, the tiger.